Meet Brad Wegman, our 2018 USC Lats Legacy Baseball Scholar! The Lats Legacy Foundation is proud to announce the 2018 USC Lats Legacy Baseball Scholar, Brad Wegman. Tell us about yourself – year in school, major, hometown, etc. I am an academic senior but a red-shirt junior athletically. I am from Temecula, California and attended Great Oak High School. At USC I am in the Price School of Public Policy and am majoring in Real Estate Development. What’s your favorite part of being on the baseball team at USC? What’s your favorite thing about the sport in general? My favorite part about playing at USC is being able to compete at the highest level against the top programs in the country. The culture and history that the baseball program has is top notch and allows me to push myself on a daily basis. Playing baseball has given me the opportunity to attend this great university, and has taught me life lessons that I will use forever. I love going out on a daily basis and playing alongside 34 other guys with the end goal of making it to Omaha. 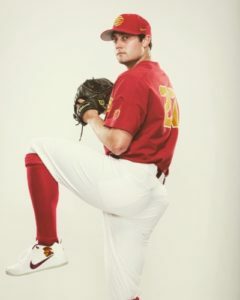 I am a pitcher here at USC. Throughout my career I have been in basically every role possible, but this year have been a late inning reliever. What are your plans for after college? My plans for after college are to continue my baseball career playing professionally. Outside of playing baseball, I hope to get into the real estate field and work in the Los Angeles area. I also plan on attending graduate school and getting my MBA. © Copyright The Lats Legacy Foundation. All rights reserved.